Submitted by adminkyvelou on Thu, 18/09/2014 - 08:46. "MARITIME SPATIAL ISSUES : MARITIME DIMENSION OF TERRITORIAL COHESION, MARITIME SPATIAL PLANNING, SUSTAINABLE BLUE GROWTH"
Submitted by adminkyvelou on Fri, 07/03/2014 - 21:48. Submitted by adminkyvelou on Wed, 06/11/2013 - 18:10. Submitted by adminkyvelou on Wed, 06/11/2013 - 16:56. The workshop is organized by the Greek ECP and will be held in Athens on 7 November, at the Ministry of Administrative Reform. This interactive workshop aims to support regional governors, policy makers and practitioners at regional level by promoting a strategic thinking for territorial development in their regions. Sustainable, inclusive and smart growth will be projected by means of the NEXUS methodological tool, towards an integrated development approach, the delivery of more efficient ESIF regional schemes and the achievement of the objectives of EU2020. ESPON Projects reflecting the priorities of the Greek presidency to the EU Council will be presented and discussed. Submitted by adminkyvelou on Sun, 31/03/2013 - 11:55. 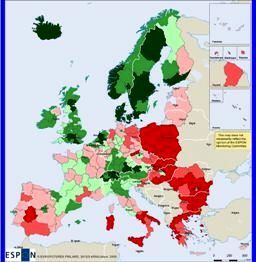 Are European planners familiar with ESPON findings? The Greek ESPON Contact Point organized, in cooperation with the ESPON Coordination Unit and the ESPONTrain Partners, the Final Transnational ESPONTrain Conference“Are European planners familiar with ESPON findings? 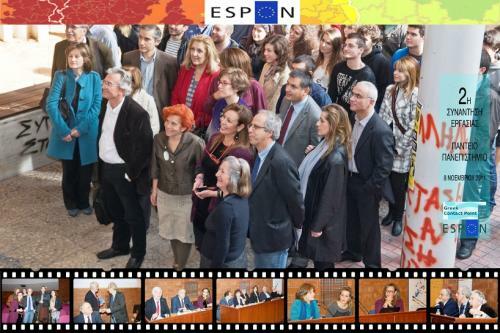 Integrating ESPON in higher education and policy making at central, regional and local levels”. The Conference took place in Athens (Greece) on 3-4 April 2013 and brought together 298 participants representing the ESPON CU, ESPON Monitoring Committee, ESPON Contact Points, ESPONTrain Tutors and Trainees as well as stakeholders participating in ESPONTrain and previous TNAs (e.g INTERSTRAT), mainly Universities and training centres (e.g the National Center of Public Administration) but also ministries and regional/local authorities. Postgraduate and graduate level students in territorial development fields were also present. 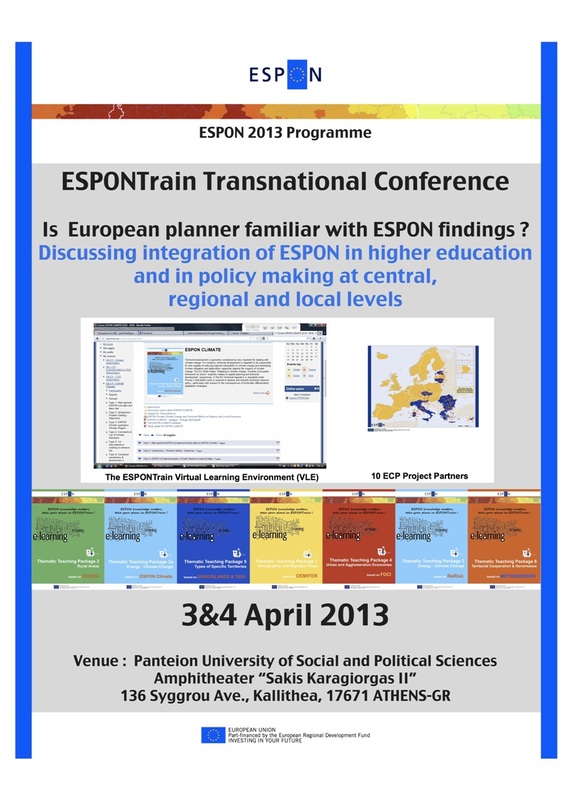 As recent ESPONTrain implementation showed and this is widely reported, the best part of the teaching/learning experience is the fact that ESPONTrain largely neutralized some of the skepticism surrounding the ESPON projects, clearly marked their limits and highlighted the benefits from their use in every-day planning and policy making. Enhance transnationality of the ESPONTrain Project, bringing together the ESPON Coordination Unit, 10 ESPONContact Points (ECPs) participating in the ESPON Programme as well as trainers and trainees involved in the ESPONTrain Virtual Learning Environment Project. This first day focused on the issue of using ESPON findings in higher education and in territorial development strategies. Participants mostly came from higher education institutions, both professors and students as well as from state and regional authorities. allow policy makers and practitioners to discuss themes for further integration of the ESPON knowledge in the implementation of territorial development and cohesion in Southern Europe and the Mediterranean. The profile of European planners (qualifications, skills, etc.) required to meet the challenges of territorial development and cohesion in Europe and the necessary innovation that ESPON can bring in its education. Participants were welcomed by the Vice Rector of Panteion University of Social and Political Sciences of Athens and the Greek ECP. Salutations were given by : the Minister of Environment, Energy and Climate Change, the Vice Rector of the National Technical University of Athens, the Greek representative in the ESPON Monitoring Committee, Representatives of the Region of Attica, members and experts of the Greek ECP. The opening speeches by Peter Billing ( ESPON CU) and Stella Kyvelou (ESPONTrain LP) identified the ESPONTrain Project in the larger context of ESPON and its concept, structure, achievements, results and lessons learned by its implementation in the ESPON countries. Followed 4 Round Tables that gave the opportunity to explore the degree of appropriation of the ESPON Findings both by the academic community and the state, regional and local authorities and the great potential of ESPON knowledge demand by higher education and stakeholders that the ESPONTrain could efficiently respond to, in the near future. These round tables also gave the opportunity to present ESPONTrain Project’s implementation in each participating country from different points of view, the one of the ECPs and this of the Trainers and the Trainees involved in the educational cycles which inspired the discussion on future ideas and demands for further implementation. 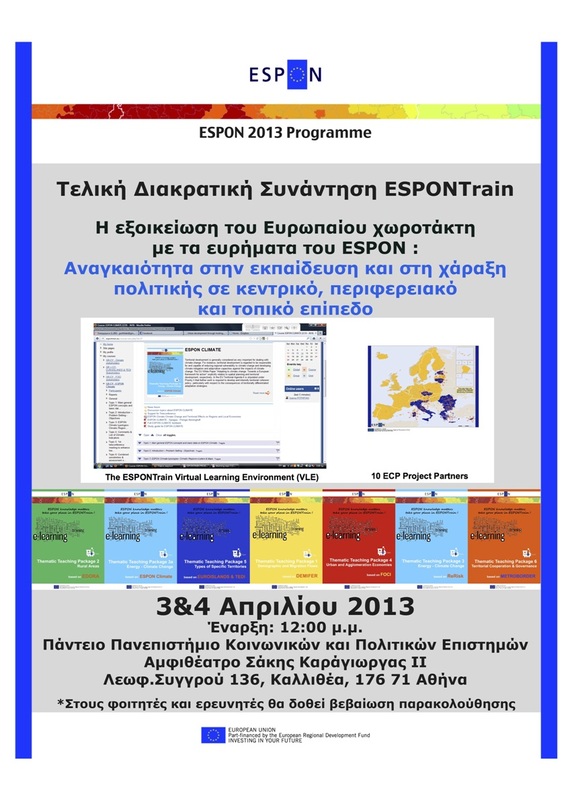 There is indeed a large potential in ESPON education, a fact that was clearly revealed by the ESPONTrain Final Transnational Conference and the participating ECPs asked for the continuation of the Project in order to reach more target groups of potential trainees and add more knowledge coming from the ESPON Projects in the existing ESPONTrain Virtual Learning Environment. 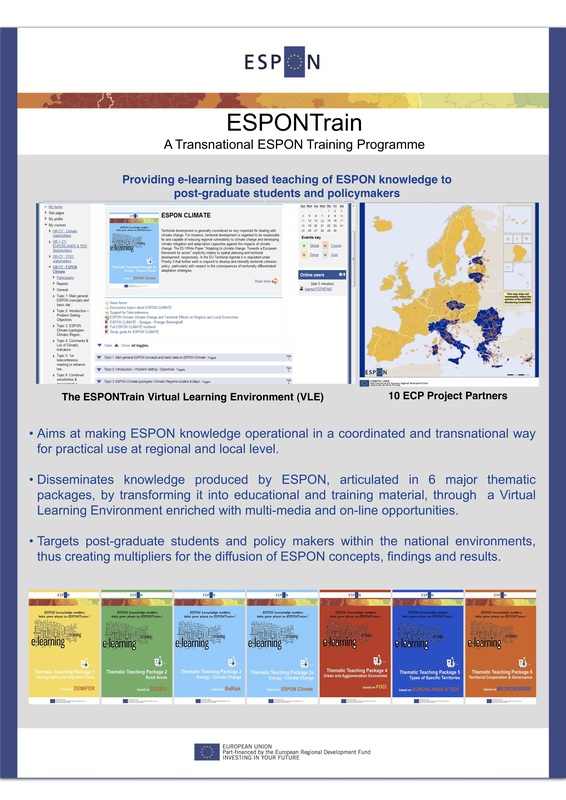 The ESPONTrain project contributed to the familiarization of specific target groups with ESPON results and vocabulary, but has also been a major input to the strategic goals of ESPON: on the one hand forming the next academic generation in ESPON related research, and on the other hand contributing to the “European territory of tomorrow” by developing learning efforts towards higher education institutions. Furthermore, Since a large majority (70%) of the countries involved in the ESPONTrain Project were Mediterranean and Balkan (Greece, Italy, Slovenia, Cyprus, Malta, Romania, Bulgaria) and due to the positive response of the trainees and trainers in this region, a new initiative based on the ESPONTrain VLE Project could be considered in form of an educational ESPON “pole of competence” in the Mediterranean region, which also would contribute to the extension of ESPON towards neighboring countries. The location of this “pole” could be Greece or Cyprus which can have significant results for the extension of ESPON towards neighboring countries. This strategic goal of ESPON can be facilitated by and based on the ESPONTrain VLE Project. The above proposal has been assisted by all Greek Universities and Training Centres present at the Conference as well as by Greek politicians. Another important continuation, capitalization and synergy effect of the ESPONTrain Projects’ philosophy and successful implementation is the new TNA entitled “USESPON” whose Lead Partner is the UK ECP (RTPI) and partner with tasks mainly related to VLE further development mainly on ESPON Tools and the use of ESPON findings by regions is the Greek ECP (Panteion University) that is the Lead Partner of the ESPONTrain Project. Considering that the theme is interesting to a wider audience, ESPON Contact Point will produce a report which aims at disseminating the main outcomes of the event based on the discussions registered during the Conference. Please find below the programme, the press releases and the presentations made during the event. Photos: Efi Apostolopoulou and Nikos Apostolopoulos. More photos are available in the Gallery. Poster of the meeting here ! Submitted by adminkyvelou on Fri, 18/01/2013 - 12:58. Submitted by adminkyvelou on Fri, 06/04/2012 - 23:24. 2nd ESPON-INTERSTRAT meeting,8.11.2011,"ESPON findings in service of a new paradigm of regional development in Greece"
Submitted by adminkyvelou on Sun, 16/10/2011 - 16:46. § regional organisation based on the new geography created by the administrative reform «Kallikrates» and how this new reality can integrate strategic planning and integrated territorial development strategies in favour of the new municipalities and the new regions, especially in the framework of the post 2013 cohesion policy. § the ESPON findings deriving from the ESPON Project and their potential contribution in Greek policy making at regional and local levels. § The future orientation and the role of cities as driving forces for smart, sustainable and inclusive growth in Europe, through the procedure of strategic planning and regulation. Submitted by adminkyvelou on Wed, 03/11/2010 - 00:51. Submitted by adminkyvelou on Tue, 02/11/2010 - 12:49. ATTREG is an ESPON Priority 1 project which is economically focused and looks at the process of agglomeration within city regions across Europe. The project aims to create a better understanding of optimum scales for urban form and agglomeration. The first international workshop entitled 'Exploring Attractiveness' will take place in Leuven, Belgium on 19 November 2010. Contact Loris Servillo for more details and registration.